SMP 시스템에서 캐시 coherent가 disable되어 있으면 enable시킨다. d-cache를 모두 flush(invalidate + clean)한다. 현재 프로세스와 관련 있는 ERRATA(프로세스 에러 패치)를 적용한다. TTBR1에 TTB_RGN_WBWA | TTB_S를 설정한다. *      on. Return in r0 the new CP15 C1 control register setting. *      This should be able to cover all ARMv7 cores. tst     r0, #(1 << 6)                   @ SMP/nAMP mode enabled? ACTLR.SMP를 읽어 0으로 되어 있으면 1로 다시 바꾼다. and     r10, r0, #0xff000000            @ ARM? ERRATA 루틴들을 적용하기 위해 확인목적으로 read MIDR 한다. r5를 우측으로 16비트 쉬프트하여 r6와 합친다. r0=r0를 우측으로 4비트 쉬프트한 후 lsb 12비트만을 가져온다. zero: TTBCR에서 사용할 0값이 담겨 있어야 한다. ttbr0 |= TTB_RGN_WBWA|TTB_S -> 기록하지 않음. ttbr1 |= TTB_RGN_WBWA|TTB_S -> 실제기록까지함. read ID_PFR0.ThumbEE[15..12]: 12번비트가 1이면 ThumbEE가 지원됨. 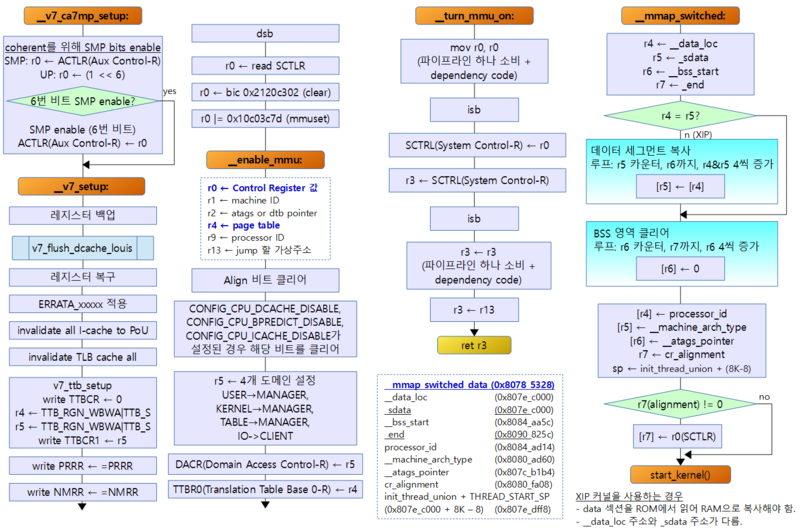 orr     r5, r5, #(1 << 10)              @ set SW bit in "clear"
bic     r6, r6, #(1 << 10)              @ clear it in "mmuset"
lr=__enable_mmu: 의 물리 주소가 담겨 있음. * Macro for setting up the TTBRx and TTBCR registers. * - \ttb0 and \ttb1 updated with the corresponding flags. VE: Interrupt Vectors Enable: 0=use FIQ and IRQ vectors. 1=impl. HA: Hardware Access flag enable.